AN Auckland family have told how their tetraplegic son's identity was stolen by an Israeli secret agent who moved in just down the road. Zev Barkan, who has fled New Zealand and escaped the justice faced yesterday by his two co-accused spies, lived within 300m of the man in whose name he applied for a passport to assume a New Zealand identity. "Barkan lived in the street next door to where [the victim] was living," said his father, speaking exclusively to the Weekend Herald. "He must have been able to see all these handicapped people going around in wheelchairs. I don't know if that is relevant or coincidence." 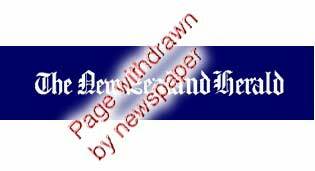 WE regret to say that the online staff of the New Zealand Herald have required us on Wednesday, August 11, 2004 to remove the remainder of this article from the website. It may be that they themselves had come under pressure. We consider their attitude to be at variance with the spirit of the Internet, but have little choice in the matter.